Great news! Piano Escapade, the opening track from my Butterfly Rapture album, has been nominated for a 2016 Hollywood Music in Media Award (HMMA)! 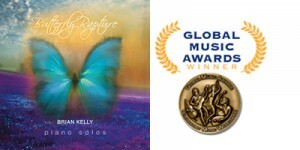 My latest album, Butterfly Rapture, has won a Bronze Medal from the Global Music Awards in the Instrumental Performance Solo category! 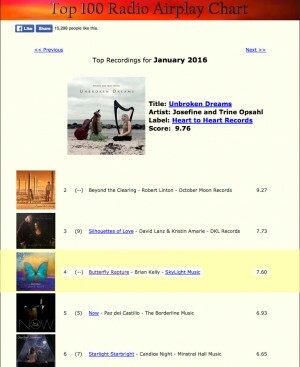 I am delighted to learn that Butterfly Rapture charted #4 on the Zone Music Reporter Top 100 Radio Airplay Chart in January 2016! Special thanks go to the radio program directors, producers, and hosts for sharing my music with your audiences; and to Ed and Stacey Bonk for promotional support. I’ve been busy mailing out my Butterfly Rapture CD to radio stations and reviewers. Maybe snail-mail will cut through the digital noise? Exciting news! Butterfly Rapture, my new solo piano album, has been nominated 2015 “Contemporary and Modern” Album of the Year by SoloPiano.com. Congrats to my fellow nominees! The winner will be announced January 26, 2016. The new CDs arrive! 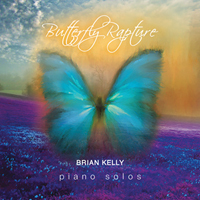 Butterfly Rapture solo piano album by Brian Kelly. The release date for Butterfly Rapture, the new album by composer/pianist Brian Kelly, will be October 1, 2015. 88 Days until my new solo piano album, Butterfly Rapture, will be released on Oct. 1st, 2015. Here is the album cover design for Butterfly Rapture, the forthcoming solo piano album by composer/pianist Brian Kelly. The mastering session for Butterfly Rapture, the solo piano album by Brian Kelly, took place on 4/17/15 with engineer Gary Mankin in San Francisco. Perhaps the most challenging part of album production for me is naming the pieces! Initially, I identify my pieces by the date of conception (for example, 20140316). Gradually, over weeks and months, I collect titles that evoke the mood of the piece. Then I check iTunes to see if those titles already exist. If so, I eliminate or modify those titles. I’m proud to say, all but one of these titles is unique on iTunes – at least, as of today! The final song list becomes a cohesive set of images that suggests a story and exists as a condensed form of poetry. It’s all part of the artistic process. Mixing sessions for Butterfly Rapture, the solo piano album by Brian Kelly, took place on 11/7/14 and 12/27/14 with engineer Gary Mankin in San Francisco.